For all deliveries from Japankoi.net to consumers (§ 13 BGB German Right), these Terms and Conditions (GTC). 3.1. The presentation of products in our online shop is subject to a legally binding offer, but an invitation to order dar errors. 3.2. By clicking the "order" in the last step of the ordering process enter a binding order for the goods in your cart. The sales contract is concluded when we accept your order an order confirmation via e- mail immediately after receiving your order. The contract text is stored on our internal systems. The terms and conditions can be viewed at any time on this page. The order information and the terms and conditions will be sent via email. After completing the purchase of the contract for security on the Internet is no longer available . Please avoid damage and contamination of the product . Send the goods if possible in their original packaging with all accessories and with all packaging components to us. Use a protective outer packaging. If you do not have the original packaging, please provide a suitable package for adequate protection against transportation damage . Send the goods if possible not carriage forward to us. We will reimburse you also like to request the postage in advance , if they are not to be borne by you . Please note that the above paragraphs 1-2 is not a prerequisite for the effective exercise of the right. 6.1. The quoted on the product pages include the legal VAT and other price components. 6.2. The shipping costs depend on the amount of goods ordered and the mode of shipment and will be clearly informed before submitting your order. An overview on the shipping page. 7.1. Delivery is only within Germany, Belgium, Denmark (excluding Greenland and Faroe Islands), Estonia, Finland (excluding Åland), France (excluding overseas territories), United Kingdom of Great Britain and Northern Ireland (excluding overseas territories), Ireland, Italy (except Livigno, Vatican, San Marino), Latvia, Lithuania , Luxembourg, Monaco, Netherlands (excluding overseas territories), Austria, Poland, Portugal (excluding Azores and Madeira), Sweden, Slovakia, Slovenia, Spain (except Ceuta, El Hierro, Fuerteventura, Gran Canaria, La Gomera, Lanzarote, La Palma, Melilla, Tenerife), Czech Republic, Hungary, Switzerland and Liechtenstein. 7.2. Information on delivery times can be found on the product page and at the menu Shipping & Returns. 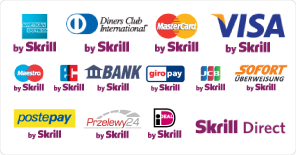 8.1 Payment can be made by cash on delivery, prepayment as well as on payment services of our payment provider PayPal and Skrill Moneybookers. 8.2. If the advance payment, we will provide our bank details in the order and deliver the goods after payment. 8.3. A right of set off is available only if your counterclaims have been established in court or are undisputed or acknowledged by us in writing. 8.4. You can only withhold payment if the claims from the same contractual relationship. All products offered are shipped within the expiration period. You have the ability to close the contract in German or English. The choice of language within the shop system determines the respective contract language.